Posted on March 19, 2019 by Ryan D.
In Your Words is a regular feature of Mass Audubon’s Explore member newsletter. Each issue, a Mass Audubon member, volunteer, staff member, or supporter shares his or her story—why Mass Audubon and protecting the nature of Massachusetts matters to them. If you have a story to share about your connection to Mass Audubon, email explore@massaudubon.org to be considered for In Your Words in a future issue! I arrived in Northampton on Labor Day weekend in the fall of 1961. I was 25 and unmarried. My second-floor apartment looked out on a parking lot and then beyond to the Mill River. Sometime over that weekend I decided to explore and followed the Mill River down through the meadows. Crossing the bridge where the river flows into the oxbow and trying to return back on the opposite side, I encountered signs that informed me I was entering Arcadia Wildlife Sanctuary. Not wanting to trespass, I turned around and retraced my earlier route into town. I had been newly hired by the Botany Department at Smith College to teach, among other subjects, plant ecology. I wanted to take my students on a field trip and wondered whether I could take them to the wildlife sanctuary since the state’s woodlands were closed due to drought and a threat of forest fires. We drove out that Friday afternoon to the white farmhouse that serves as Arcadia’s offices and knocked on the door. The person who answered was Ed Mason, the sanctuary director. He graciously welcomed us. We walked down the trail to the Mill River and its marshes, the first of many such expeditions through the years for class field trips and an assortment of independent research projects. I learned that a colleague was serving on the sanctuary advisory committee, and she eventually asked me to replace her. It was an obligation I happily took on. In the five decades since, I have focused my volunteer activities on issues of ecological management. I’ve worked with students and sanctuary staff to document the plant life of the area and identify patterns of vegetation and its responses to outside forces, such as oil ollution in the marshes, invasion by aggressive non-native species, and a changing climate. Carefully documenting these changes over time provides important data that can help inform and guide conservation efforts. As a period of accelerated climate change becomes increasingly likely, I hope that my work with students and staff will better position us to meet the challenge. John Burk is Professor Emeritus of Biological Sciences at Smith College and a longtime volunteer at Arcadia Wildlife Sanctuary in Easthampton and Northampton. 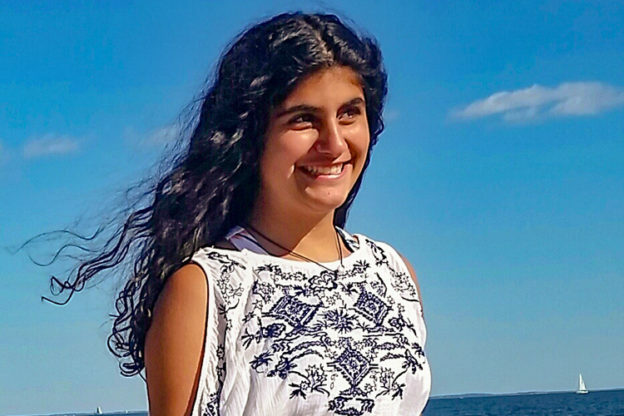 This entry was posted in In Your Words and tagged arcadia, explore, volunteer on March 19, 2019 by Ryan D..
Posted on December 20, 2018 by Ryan D.
Fourteen-year-old Mia Papazian loves hip-hop, dance, Spanish class, ice hockey, and camp. She has attended Boston Nature Center (BNC) Summer Camp in Mattapan since she was five. Here, this nature hero tells us what keeps her coming back every summer. I have always been “into” nature, even though my family never camped before. I like the smell of the breeze and the fresh air, looking at plants and animals and bugs… there’s nothing I don’t like about being outdoors. That’s why I started coming to camp at BNC. There are so many parts of camp I love, it’s hard to pick a favorite! Some of my best memories are the sleepovers—staying overnight at camp with my friends, sleeping in tents, learning how to build a fire, and making s’mores. I really enjoy the nature walks. Before I came to camp, I used to be afraid of bugs. But during these walks we learned a lot about plants and insects. Now, I would never kill a bug, and if I see one inside, I bring it outside. Mia (third kayak from right) paddling while volunteering at Wildwood, Mass Audubon’s overnight camp. The counselors are also amazing. They’re really nice and I feel like I can trust them because I’ve known most of them for years, including Rebecca, Kim, and Zimmie. To me, a “nature hero” is somebody that’s passionate about nature and excited to learn, and that’s what the camp counselors are like. This past summer was my first year as an LIT (Leader-in- Training), and it was so fun. I loved working with the Owls (the youngest camper group). They’re really cute. I got to read stories to them and take them on nature walks. I hope that they had fun, too, and learned to love and respect nature, each other, and the counselors, like I do. This entry was posted in In Your Words and tagged BNC, camp, day camp, explore on December 20, 2018 by Ryan D..
Posted on September 25, 2018 by Ryan D.
Mass Audubon is a golden thread—no, a circle—that has run through my entire life. It started back in 1971 when I was able to get a city-sponsored summer job. Awakened by the Earth Day movement, I asked to work outdoors. 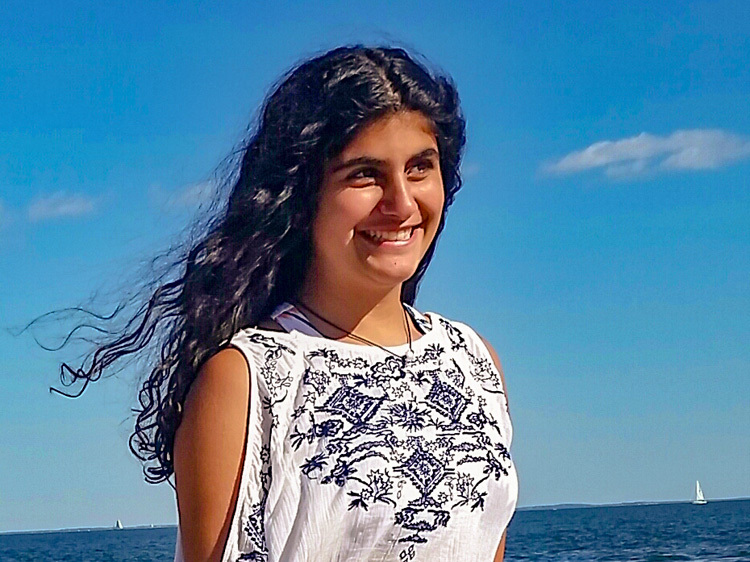 Mass Audubon agreed to host a precocious and completely “green” (in more ways than one) 16-year- old at Pleasant Valley Wildlife Sanctuary in Lenox. I cleaned the museum and gift shop, fed and occasionally wore the boa constrictors (much to the delight or fear of our visitors), and helped with the nature camps. After studying as a biologist and earning my BS in Marine Biology from the University of West Florida in Pensacola, I worked in various roles to protect water, wetlands, and wildlife for almost 40 years. I am profoundly grateful for and proud of the opportunities I had to serve at the regional, state, and federal level, but the last 29 years with the U.S. Fish and Wildlife Service were the most rewarding. I had the great privilege to manage national wildlife refuges in the Northeast, including eight in Eastern Massachusetts. There, working with wonderful staff, volunteers, friends, and conservation partners, including Mass Audubon, we managed and restored wildlife and habitat on 17,000 acres of land and water and provided opportunities to learn about and connect with nature to more than half a million visitors per year. 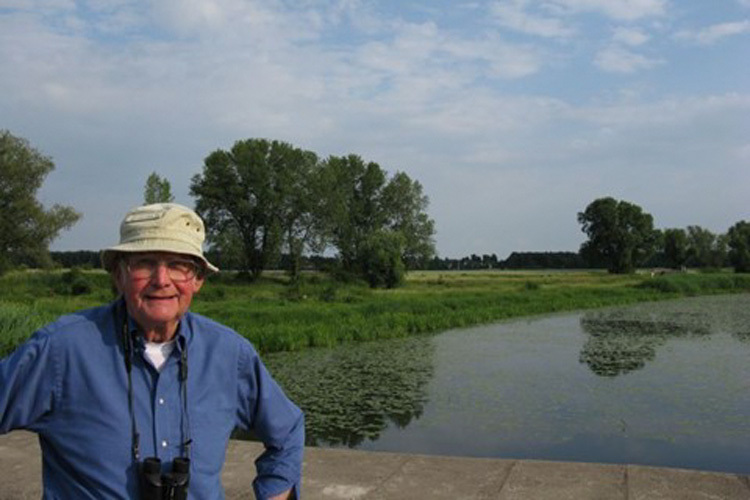 Now in retirement, I find myself connected to Mass Audubon in a different but still deeply rewarding way. 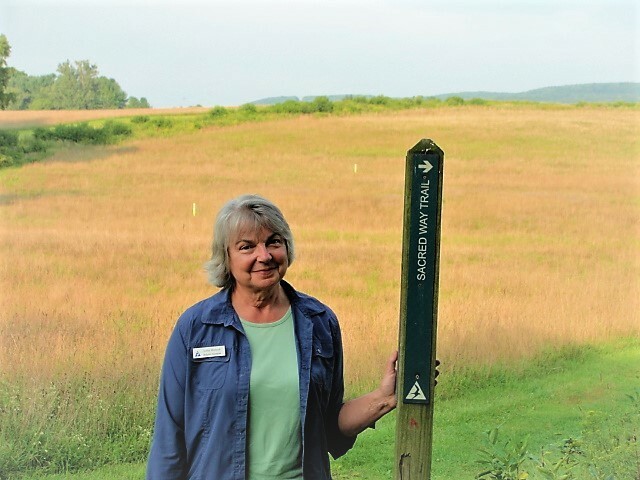 As a volunteer at Canoe Meadows Wildlife Sanctuary in Pittsfield and at Pleasant Valley, I have led trail maintenance projects, developed a volunteer trail steward program, pulled invasive garlic mustard plants, and helped with special events, to name just a few of the projects I have worked on. As a member of the Berkshire Sanctuaries Advisory Committee, I provide input on policies and programs. I am thrilled that my expertise and experience is helpful to a place that I love with all my heart. Coming back to Mass Audubon feels like a symbolic closing of the circle of environmental protection that began here almost 50 years ago and has enriched my life in so many ways. 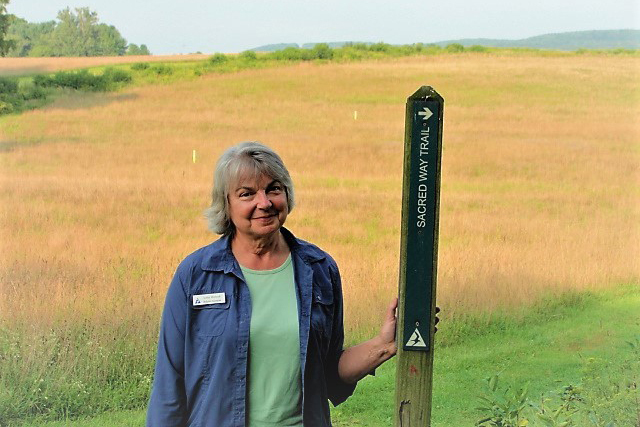 Libby Herland is a Berkshire Wildlife Sanctuaries Advisory Committee Member and volunteer. This entry was posted in In Your Words and tagged berkshires, canoe meadows, explore, pleasant valley, volunteer on September 25, 2018 by Ryan D..
Posted on June 27, 2018 by Ryan D.
As a native Chilean, my passion for the oceans and their critters began in the vibrant Pacific Ocean. Led by my father’s love of the sea, I spent long summer days on the coast, where we would be the first ones in the water and the last ones out, forced back onto land as the sun nestled under the horizon. Since my time as a child in Chile and throughout undergrad and graduate school, I have been fortunate enough to travel for research and explore a variety of coastlines—from the pristine coral reefs of marine preserves in Puerto Rico to the dazzling Mediterranean waters of Spain. These adventures have been juxtaposed with visits to the polluted streams and oceans in Ecuador, the volcanic islands and surrounding waters of the West Indies, and nearby streams in the Greater Boston area. I noticed that where pollution was greatest, there was also a considerable difference between socioeconomic classes and a limited amount of environmental education. These disparate experiences laid the foundation for my path to conservation and urban education, where my interests are very much aligned with the mission at Mass Audubon. Today, as part of Mass Audubon’s Coastal Waterbird Program (CWP), I protect endangered shorebirds and their habitat, focusing on educating the diverse urban community of Revere and the metro Boston area. 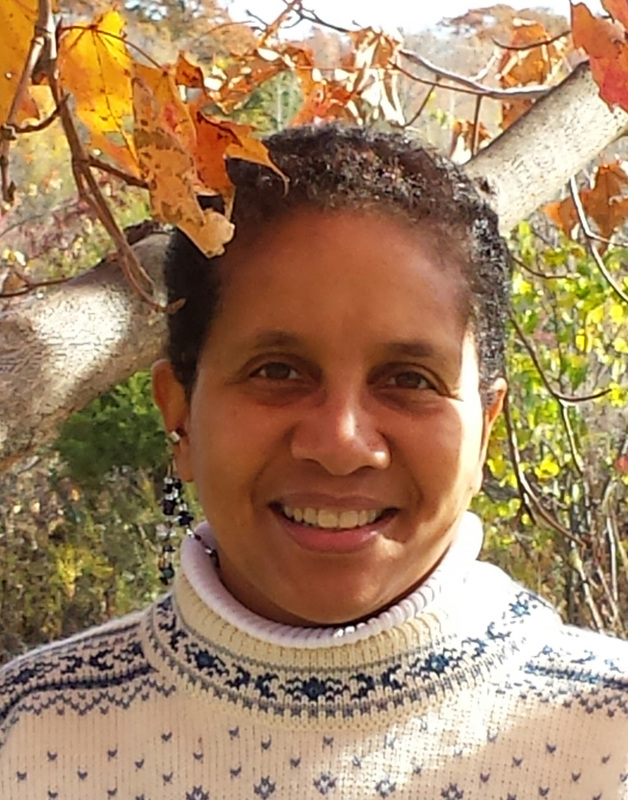 In addition, I’m a teacher naturalist at Mass Audubon’s Boston Nature Center, where we provide positive outdoor experiences and environmental science education for urban youth who would ordinarily not have access to wild and natural outdoor spaces. Mass Audubon has enabled me to transform my natural curiosity for the oceans and wildlife and passion for reaching underserved populations into my profession. 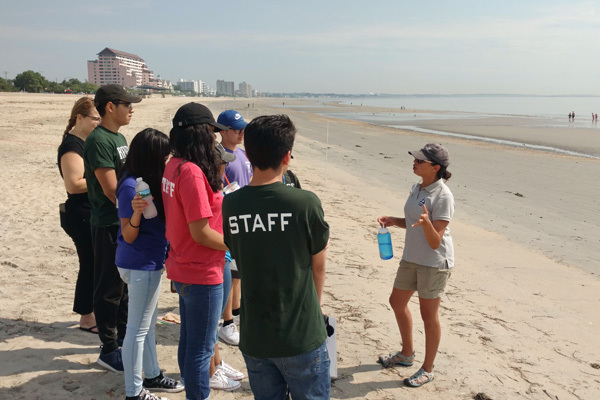 Through my work with Mass Audubon, I am able to conserve the nature of Massachusetts by interacting with and engaging Boston’s urban youth, adults, and families in dynamic and enriching educational opportunities. It’s a dream come true. 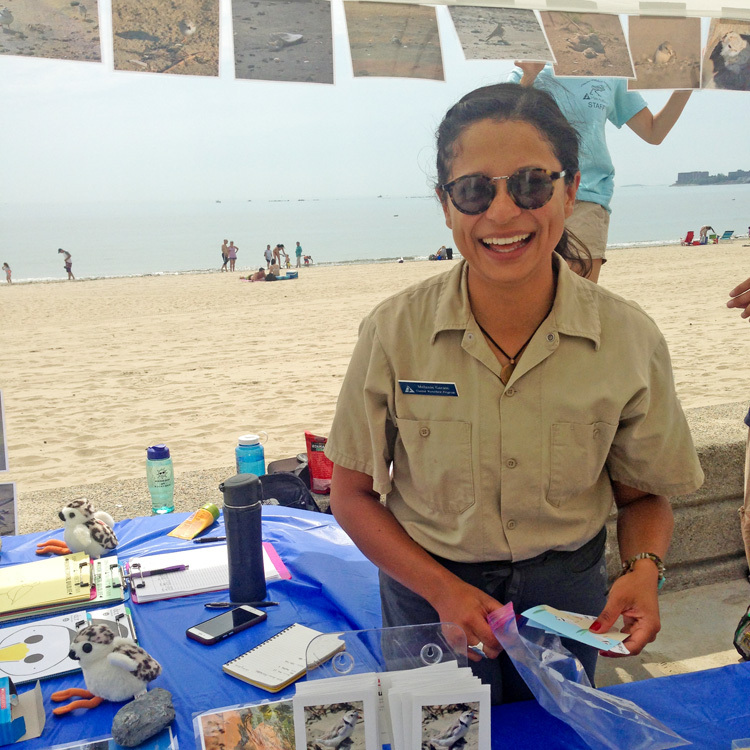 Melanie Gárate is a Coastal Waterbird Education Specialist and Teacher Naturalist at Mass Audubon’s Boston Nature Center. 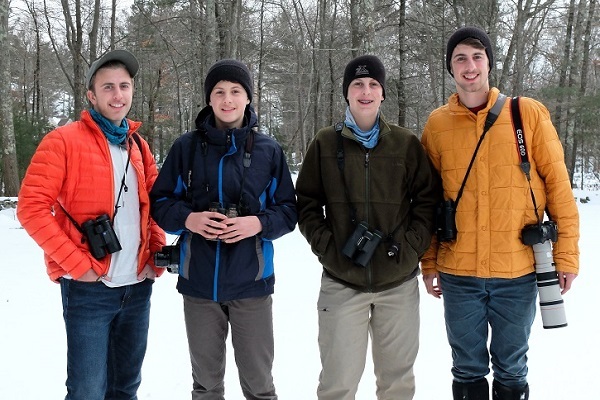 This entry was posted in In Your Words and tagged BNC, Boston Nature Center, Coastal Waterbird Program, explore, shorebirds on June 27, 2018 by Ryan D..
Posted on March 21, 2018 by Hillary T.
One day in April 2011, we four Eckerson brothers— Jonathan (then 12), Matt (then 10), Joel (then 9), and myself, Andy (then 11)—started listing as many bird species as we could in a small notebook. This began our unofficial town bird club. Growing up in a rural area in southeastern Massachusetts, we were lucky to have 500-plus acres of woods behind our house to explore and roam. But it wasn’t until that spring day that our interest in birds and wildlife really took off. From there, we attended walks at Mass Audubon’s Oak Knoll and Attleboro Springs Wildlife Sanctuaries led by an amazing guide, Jack Lash. He poured out his seemingly unending knowledge of the natural world, which ignited our love of all fauna. After a year, our enthusiasm for birdwatching turned from a hobby into an obsession. The four of us were always birding together in our yard, in the woods behind our yard, and on our neighbor’s farm (with permission). If we could offer any advice to young people, it would be to find someone to share your passion with. Whether it’s your mom, dad, sibling(s), mentor, or someone you just met, enjoy this world’s beauty together. Then, learn all about the living creatures around you. When we started, we knew nothing. We read a lot and got involved with Mass Audubon. Jonathan and I conducted breeding surveys for Oak Knoll and Attleboro Springs Wildlife Sanctuaries and became Mass Audubon interns. 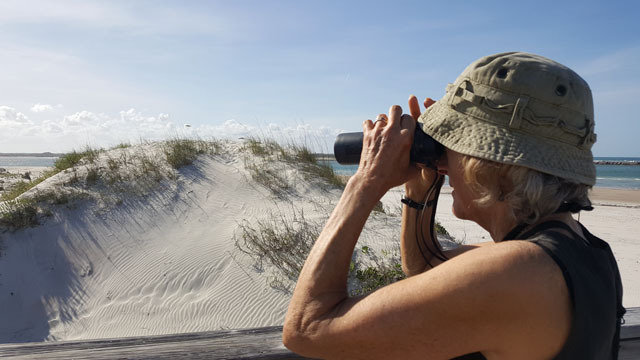 We now regularly attend the Birders Meeting and look forward to connecting with fellow birders and hearing the great speakers. We especially enjoy entering the annual Picture This Mass Audubon Photo Contest. When our family purchased a point-and-shoot Canon SX50 HS PowerShot camera with a 600mm zoom lens in 2013, our birding entered a new phase, now with the “power” of a camera added to our arsenal of optics. We have all entered the contest over the years, and Joel and I have been fortunate enough to have several winning photographs. Getting the four of us out together is a little harder now that Jonathan and I are attending college. But when we can, we make a group trip to the southern part of Bristol County to do some birding—just like old times. Written by Andy Eckerson on behalf of the Eckerson family, members since 1990. This entry was posted in In Your Words on March 21, 2018 by Hillary T..
Posted on December 17, 2017 by Ryan D.
Mass Audubon’s Wildwood was the first overnight camp I attended. I was quite homesick at the start, but as the week progressed, I had several experiences that were transformative. One morning we woke before dawn and hiked Mount Wachusett to see the sunrise. I remember the lavender pre-dawn light and how exciting it was to be up before the sun. When we got off the mountain, it was hot and we were tired, but the best was yet to come. The counselors brought us to a nearby bog, talking excitedly about a special ceremony, a sort of rite of passage to become “one with nature.” We walked along a boardwalk until we got to a spot where the water was deep and clear, and we completely immersed ourselves in the bog water. I can’t explain what made it so magical, but it clearly made an impression on me that has lasted all these years. Water has always played a central role in my life. 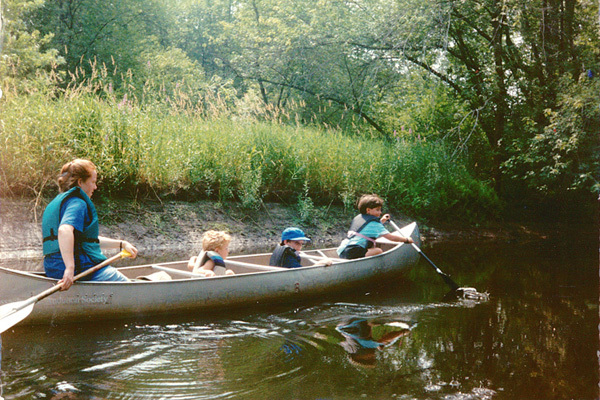 My first water adventures were with my parents in the Ozarks, where they would take me as a newborn down the Current River in a canoe, stopping to camp on gravel bars. 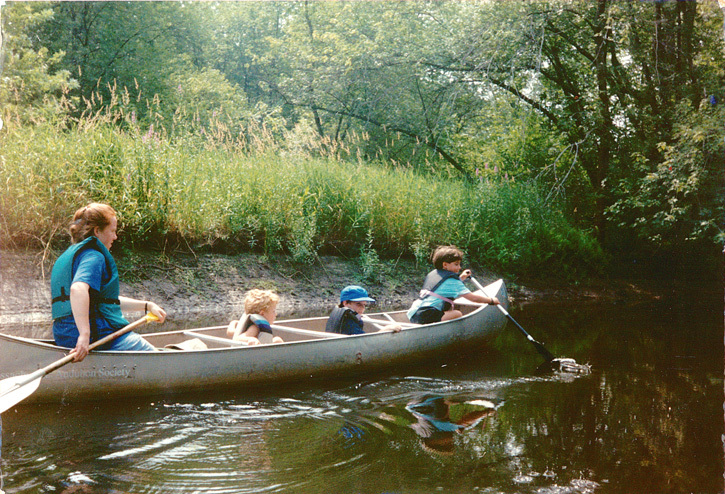 In fact, many of my childhood family vacations took place outdoors: we hiked, canoed, camped, birdwatched, and snorkeled. Looking back, I believe that day in the bog was so special in large part because of the Wildwood counselors. Their excitement and love of nature was infectious. I clearly caught the bug because years later, during summers off from college, I became a counselor myself at Ipswich River Wildlife Sanctuary’s Nature Camp in Topsfield. There, Sanctuary Director Carol Decker became a mentor who showed me how to share the magic and wonder of nature with children. As a result of these experiences, I have focused my career on protecting water—and my volunteer work on connecting children to the outdoors. My parents planted these seeds, and Mass Audubon nurtured their growth with its wonderful staff, programs, and wildlife sanctuaries. And I hope that I am doing the same for future generations. Anne Monnelly Carroll is Director of the Office of Water Resources at the Massachusetts Department of Conservation and Recreation. This entry was posted in In Your Words and tagged camp, explore, ipswich river, overnight camp, paddling, water, wildwood on December 17, 2017 by Ryan D..
Posted on September 28, 2017 by Ryan D.
In Your Words is a regular feature of Mass Audubon’s Explore member newsletter. Each issue, a Mass Audubon member, volunteer, staff member, or supporter shares his or her story—why Mass Audubon and protecting the nature of Massachusetts matters to them. My love for exploring nature probably originated from summers spent on Cape Cod with my grandparents. Days were filled investigating my grandfather’s vegetable and flower gardens, catching frogs, swimming, and going on Cape trips. 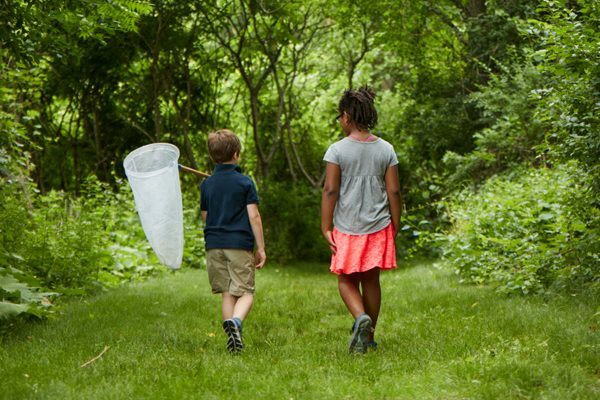 As a single mom raising two boys in Dorchester, I wanted my sons to know the fun and excitement of all things “nature”—discovering salamanders under rocks, hiking the Blue Hills, and learning about birds, bugs, and bees. I also wanted them to understand that they are the stewards of our planet. So off they went to classes at Mass Audubon’s Boston Nature Center (BNC). There, they experimented and explored in a wonderful outside-classroom setting. 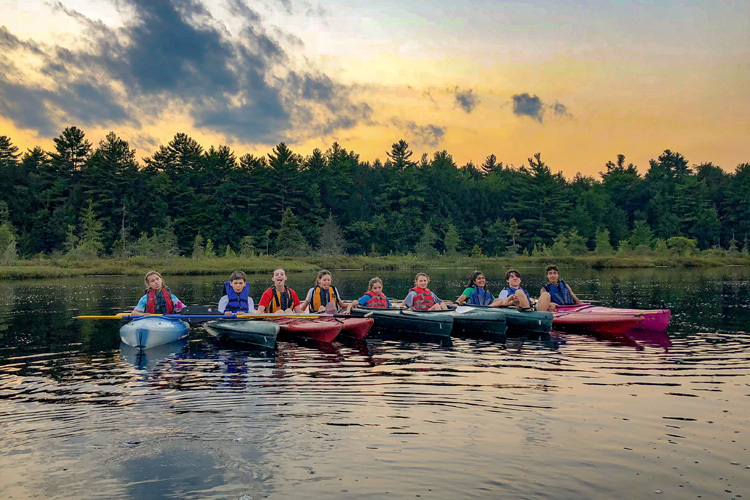 The BNC connection led to more nature experiences at other Mass Audubon wildlife sanctuaries, including the Blue Hills Trailside Museum, Drumlin Farm, Allens Pond, Ipswich River, Broadmoor, and Moose Hill, as well as at Wildwood overnight and family camps. While they took classes, I spent time reconnecting with nature by volunteering at BNC. Through these experiences, I gained a deep appreciation for the director, staff, youth leaders, and all of the committees. The wildlife sanctuary continues to passionately seek ways to involve diverse families from all walks of life from across the city and region. My boys are now men, but I will always remember the BNC programs that opened an entire world of nature for us, our family, and our friends. BNC has been a critical path to nature and the environment for folks living in the city that would not normally experience nature programs, wildlife, and the joy of birds, butterflies, and other small critters. I love the space, the serenity, and the beauty of nature right in my own backyard at the Boston Nature Center, and I encourage all who live near and far to come visit. Pat Spence is a Mass Audubon Council member, former chair of the Boston Nature Center Sanctuary Committee, and Mass Audubon member since 2000. This entry was posted in In Your Words on September 28, 2017 by Ryan D..
Posted on June 20, 2017 by Ryan D.
Growing up in Connecticut, most of my free time was spent outdoors, usually in the woods or swamps. As an adult living on Martha’s Vineyard, I returned to the woods for long walks and started painting local birds. About 12 years ago, a friend suggested I get involved at Felix Neck Wildlife Sanctuary. Since then, I have monitored horseshoe crabs for their citizen science project, painted several signs and murals, and served as the secretary for the Felix Neck sanctuary committee. 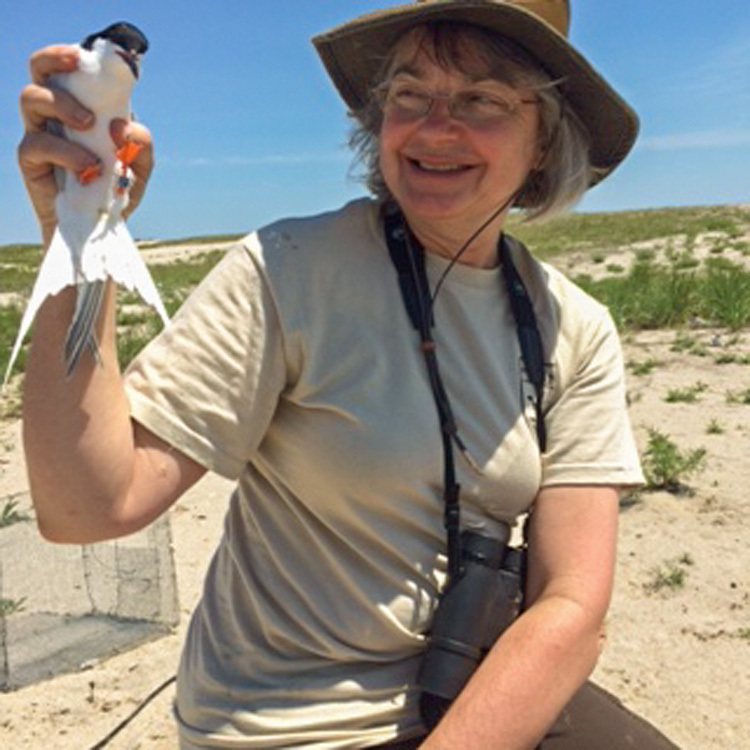 But, perhaps, the most exciting and challenging opportunity came when I began volunteering with the sanctuary’s Coastal Waterbird Program in the spring of 2013, monitoring a pair of American oystercatchers nesting in my neighborhood. Being new to nest monitoring, I needed help. The coastal waterbird coordinator at Felix Neck patiently showed me how and when to observe the birds, and what information to record. 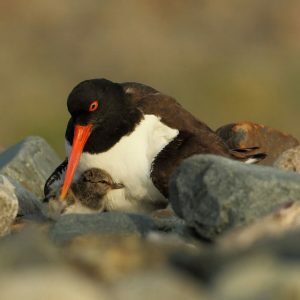 I was delighted the first time I saw a clutch of eggs in an oystercatcher scrape (a sandy, shallow nest dug by oystercatchers), horrified when a nest was lost to storm surge washover during a nor’easter, and ecstatic to see for the first time a chick emerging from the grasses. Since those first couple of years, I’ve learned so much more about the threats to these birds, particularly predators, weather, and disturbances from beachgoers and dogs. But the birds’ admirable resolve to breed and reproduce despite these challenges has inspired me. I’ve become adept at speaking to people I meet while out observing—answering questions or gently reminding them to be cautious in a restricted area. It’s gratifying to observe and record data, knowing that all of this information serves an important purpose: to help us understand population trends and factors for reproductive success so we can adjust our strategies to provide the birds the best chance of survival. This summer, I will be monitoring a second oystercatcher nest, a tern colony, and a pair of osprey. If you see me out and about, stop and say hi! Vasha Brunelle is a longtime volunteer with Felix Neck Wildlife Sanctuary’s Coastal Waterbird program, which you can learn more about on their webpage. This entry was posted in In Your Words and tagged citizen science, Coastal Waterbird Program on June 20, 2017 by Ryan D..
Posted on March 7, 2017 by Ryan D.
The Butterfly Garden Team began in 2012 with the mission of creating outdoor spaces that welcome and nourish butterflies and other pollinators. 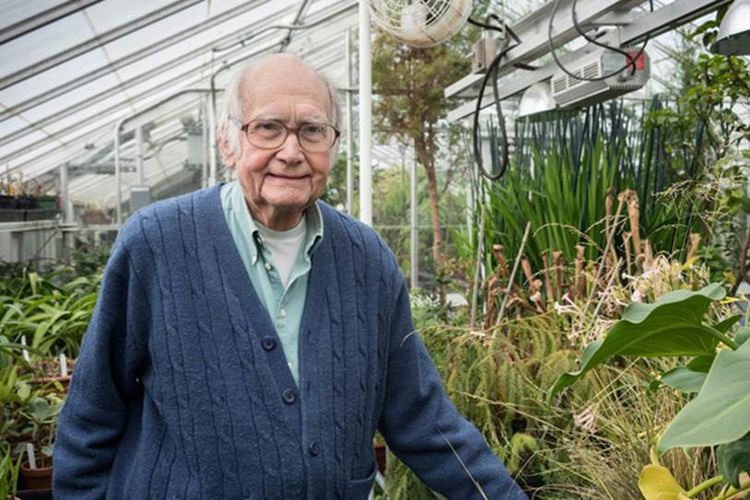 When Jessica Watson, Stony Brook’s Volunteer Coordinator, presented us with the opportunity to restore the butterfly garden at the Stony Brook Wildlife Sanctuary, it gave us a chance to do something we love right in our hometown. For us, Stony Brook has been a peaceful refuge from the stresses of work, a place to meet friends, and a way to get up close and personal with the local wildlife. The Stony Brook garden was planted in the 1990s, but was in need of attention. Invasive vines and grasses and aggressive perennials had taken over most of the nectar and host plants. With a lot of elbow grease and help from Stony Brook staff and volunteers, we renovated the garden section by section. We added two new types of milkweed for monarchs, as well as a variety of other nectar and host plants, mostly donated or started from seed. The walkway was cleared, widened, paved in crushed stone, and made universally accessible. In 2016, we received a grant from the Massachusetts Master Gardener Association and used the funds to replace a hedge of invasive honeysuckle with native and pollinator-friendly perennials and shrubs. 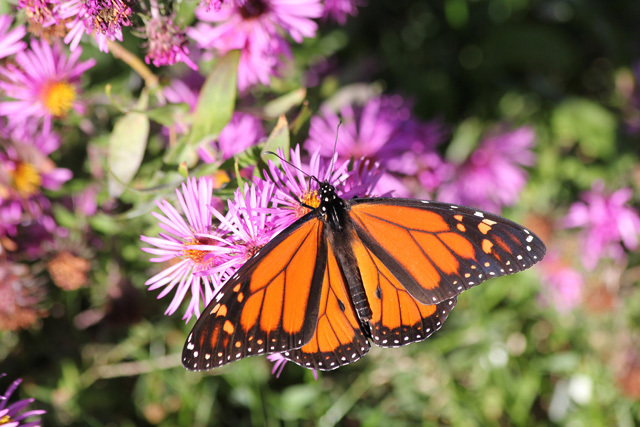 The garden is now a Certified Butterfly Garden and Monarch Waystation. We love this little “sanctuary within a sanctuary,” and the butterflies and other pollinators seem to enjoy it, too. A variety of butterflies, moths, bees, and birds join us as we weed, water, dig, plant, and mulch. We’ve even seen monarchs return! Best of all, the garden is now serving its original purpose: providing information about gardening, butterfly habitat conservation, and natural history, and serving as a quiet haven where people can relax and observe the flowers and their visitors. When we started this journey, we never imagined all we would gain in return. Working in the garden has brought us friendships, wonderful partnerships with Stony Brook staff and volunteers, and a sense of purpose and pride that comes from hard work and a beautiful garden. 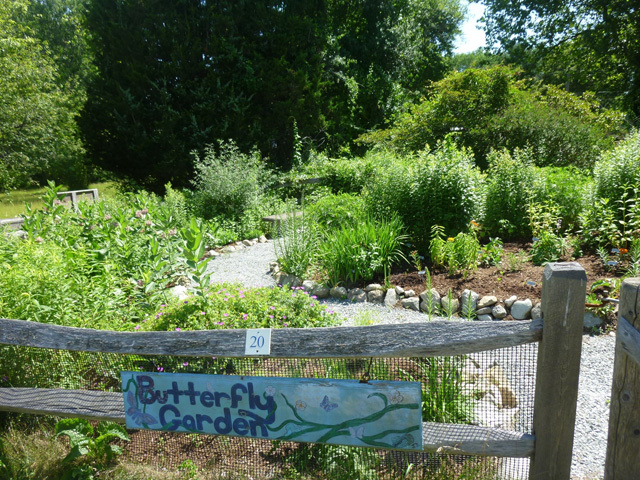 Many Mass Audubon sanctuaries have pollinator gardens. Learn more and see if there is one near you! 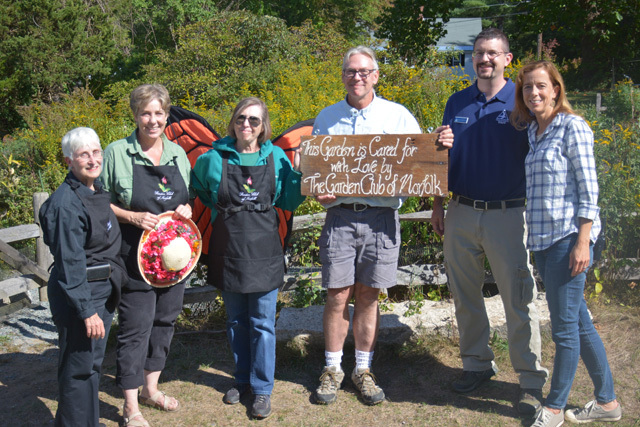 Learn more about the Butterfly Garden Team and the Garden Club of Norfolk on their website. This entry was posted in In Your Words on March 7, 2017 by Ryan D..
Posted on December 20, 2016 by Hillary T.
It’s been 50 years since I first started working at Blue Hills Trailside Museum—51 if you count volunteering. When I was a kid, my parents always let me pick a special outing on my birthday. And every year, I picked visiting Trailside. When I turned 13, I sent in a letter asking if there was anything I could do to help out. The staff accepted. Every weekend and after school, I would ride my bike 10 miles each way to Trailside to empty trash barrels, pick up litter, clean cages, feed the animals—all routine stuff, but I loved it. Eventually, I got a part-time job taking care of the animals, collecting tickets, and assisting with any other task that needed attention. In 1970, after graduating high school, I started full time as an assistant naturalist. Back then, Garret VanWart was the sanctuary director—and a mentor. He took us out on field trips to Marina Bay in Quincy, and through a scope he set up, I saw my first snowy owl. I was hooked. Everyone who knows me knows that I am not a tech person (I still use a flip phone). But I was the first person to put satellite transmitters on wintering snowy owls back in 2000 to understand their migration patterns. 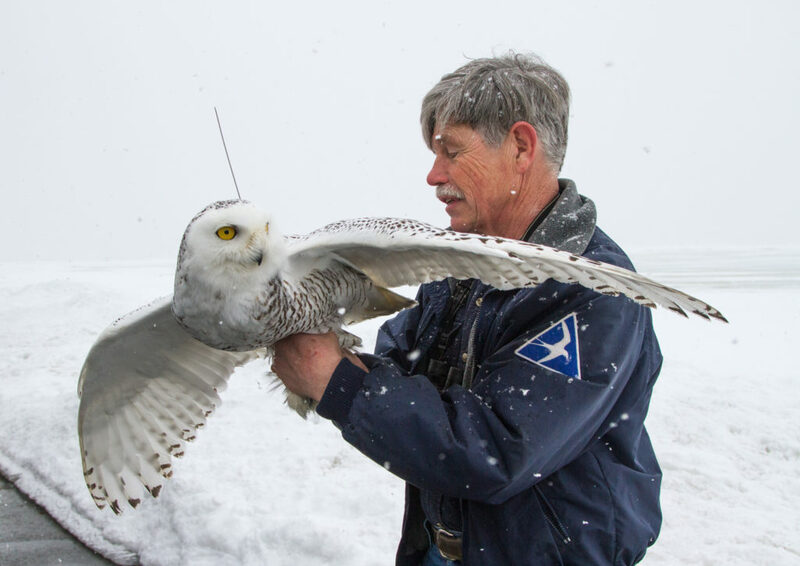 Our research was the first to prove that snowy owls returned to the arctic each spring. During this time, I used to take my son and daughter out with me to capture and release snowy owls. The transmitters have changed and so have my assistants—now I bring my granddaughters. Over the last half century, there hasn’t been one day that I have thought of leaving the museum. This is more than just a job. This is my life’s work. I want to inspire as many people as I can to care about these precious resources that we have: to encourage and kindle excitement in every child that walks through the door; to get kids and adults to put down their phones and experience the wonders of nature up close; and to help embolden the next generation of stewards to carry on the legacy to help people better understand, appreciate, and care for the world around us so future generations have the same opportunities and more. See a slideshow of photos from Norman’s 50 years with Blue Hills Trailside Museum and share your favorite Norman stories in the comments below! This entry was posted in In Your Words, Stuff We Love and tagged blue hills on December 20, 2016 by Hillary T..